Frank Kendall was the son of Frederick Smith Kendall and Elizabeth Jane Pearson. Frederick Kendall, originally from Dunolly, Victoria had trained as a chemist in Hobart before opening a shop in Oatlands Tasmania in 1885. Frank Selwood Kendall was born in 1890 at Oatlands. In 1893, when Frank was three, his mother Elizabeth died from pulmonary tuberculous. She left seven children. In 1897, Frederick Kendall took his family to his hometown of Dunolly and he ran the chemist, presumably, that of his father, a pioneer of Dunolly, pictured below in the first row, second from left, who died in 1896. Frank attended the Dunolly State School and in time, his father opened a second chemist shop in Rainbow. 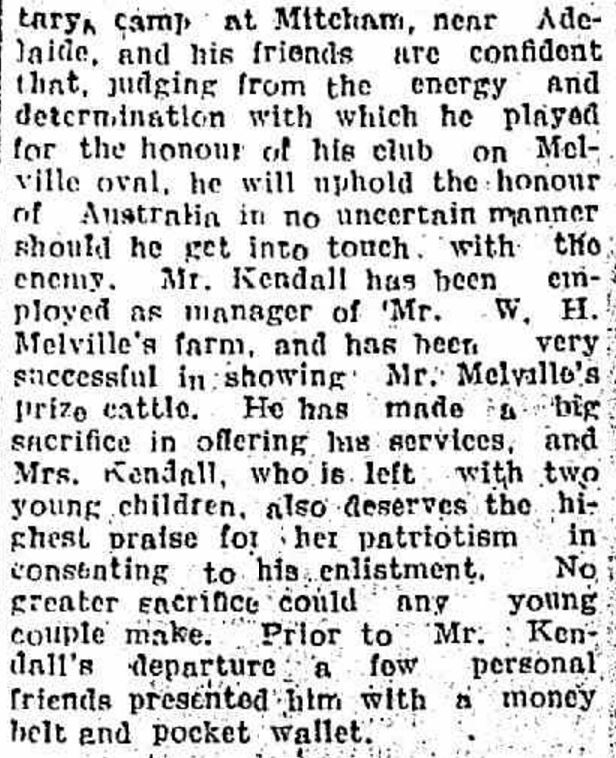 In 1911, Frank Kendall married Charlotte Payne Lackman and a son Royal Frank Selwood Kendall was born in 1912 at Kaniva. Frank and his family moved to Hamilton where son Fred was born in 1913. Frank was employed by Victorian Railways but he soon got a job as manager of William Melville’s farm Lasswade and had a lot of success showing Mr Melville’s cattle. Frank played football for the St George Football Club and was a member of the Hamilton Rifle Club. 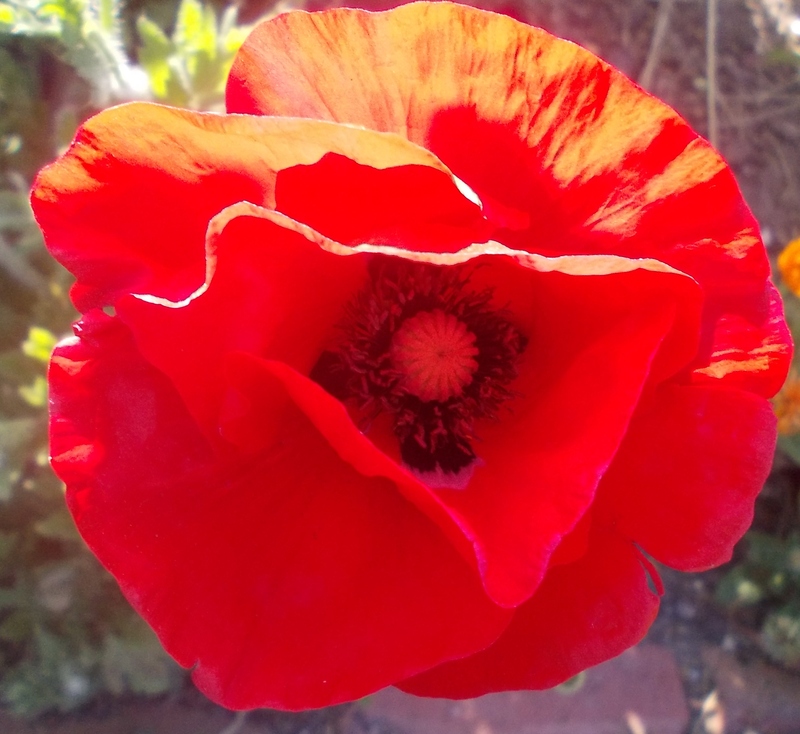 In 1915, Frank went to Adelaide to enlist then went to military camp near Mitcham, South Australia. He then completed training as a machine gunner in Victoria at Seymour. “Items of News” Hamilton Spectator (Vic. : 1870 – 1873; 1914 – 1918) 8 June 1916: <http://nla.gov.au/nla.news-article133700693&gt;. Leaving Australia in October 1916, Frank arrived at Plymouth on 28 December 1916 and was attached to the Machine Gun Training Depot. Around the end of January 1917, Frank wrote a two part letter to his father, with the first part published on 23 March 1917 by the Dunolly & Betbetshire Express & County of Gladstone Advertiser. He had been on leave in London and told his father of the sights including the House of Commons and Piccadilly Circus. 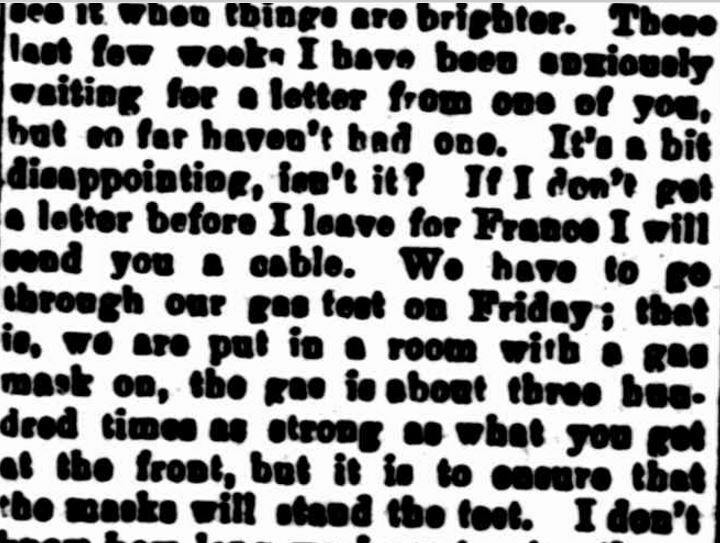 The second letter, published on 27 March 1917 continued where the first left off and he went on to say he’d been waiting for a letter from his father and expected to go overseas soon. He would complete a gas test on the coming Friday in preparation for the Western Front. “SOLDIER’S LETTER.” Dunolly and Betbetshire Express and County of Gladstone Advertiser (Vic. : 1915 – 1918) 27 March 1917 . Frank arrived in France on 28 May 1917 with the 8th Machine Gun Company and was located at Bapaume. During the first part of September, the Company was at Racquinghem in training. They then moved on to Chateau Segard in Belgium. On 16 September they moved on to the frontline at James Trench in preparation for a planned battle at Polygon Wood on 26 September. The day arrived and Frank was with a group of three other soldiers between Polygon Wood and Westhoek Ridge doing barrage work in the first line. A shell landed and killed the four men instantly. Frank was buried where he fell. At home, it was a double loss for Charlotte. Her brother Gus was killed on 20 September at the Battle of Menin Road less than a week before Frank. “Family Notices” The Argus (Melbourne, Vic. : 1848 – 1957) 24 October 1917: <http://nla.gov.au/nla.news-article1658156&gt;. Frank’s two sons Royal and Fred would have had barely any memory of their father. Royal was only four when his father went overseas and Fred just three. Royal eventually moved to Perth, Western Australia and during WW2, served with the RAAF. Fred died in 1974 aged sixty-one at Ashwood. 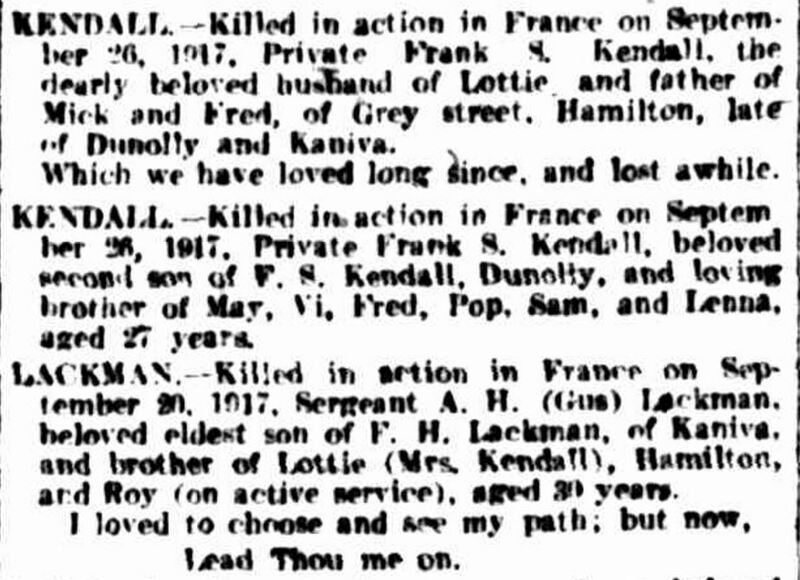 Frank Kendall’s name is on the Hamilton War Memorial.